Individuals and organisations with ideas for new projects in the arts and heritage sectors are encouraged to register their interest in an innovative new crowdfunding programme set to launch on September 14 2016. The initiative will see a series of specially selected crowdfunded projects be given up to £10,000 – or 25% of their total target amount received in donations – in matched funding. According to Nesta research, crowdfunding has grown exponentially in the UK in recent years, with the market now being worth nearly £400 million a year. Matched crowdfunding is increasingly popular: a proportion of money pledged by the crowd is then matched by an organisation, but until now there has been little research into the relative advantages and disadvantages of this method of fundraising. This pilot scheme, outlined in the government’s Culture White Paper, is the result of a partnership between UK innovation foundation Nesta, the Department for Culture, Media and Sport (DCMS), Arts Council England (ACE) and the Heritage Lottery Fund (HLF). Crowdfunder, the UK crowdfunding platform, will be launching dedicated arts and heritage campaigns as a part of the programme. The platform will also manage the distribution of the partner funds into eligible projects. One will be backed by £125,000 from ACE and will award match funding to eligible individuals looking to launch arts projects in England who are able to raise the other 75% of their target funding amount. The other will be backed by £125,000 from HLF and will provide funding to selected organisations planning projects in the heritage sector in Scotland, North-West and South West England who are able to raise the other 75% of their target funding amount. Not only will the initiative benefit a variety of projects, but it will also test the effectiveness of matched crowdfunding as an innovative way of funding arts and heritage projects. Organisations or individuals with proposals for projects to be submitted to one of the funding streams should submit their ideas HERE. A £15m scheme to help put culture at the heart of successful communities was unveiled by the Heritage Lottery Fund (HLF) and Arts Council England today. The Great Place Scheme – one of the flagship measures from the Government’s recently published Culture White Paper – will pilot new approaches that enable cultural, community and civic organisations to work more closely together. The aim is twofold: to ensure that the considerable investment in culture made by organisations like HLF and Arts Council England has the maximum positive impact on jobs, economic performance, educational attainment, community cohesion and health and wellbeing; and to persuade civic organisations and local businesses to invest in and put culture at the heart of their thinking. *Development of local strategies that turn conversations and creation of networks into action to maximise the community benefit that local arts, culture and heritage can deliver. The Great Place Scheme, using funds raised by the National Lottery, will initially be piloted in 12 locations across England and is likely to include everything from a city-wide scheme to a group of rural or coastal local authority areas. HLF is in discussion with the devolved administrations in Scotland, Wales and Northern Ireland and the scheme is expected to open in those nations later in 2016-2017. Funding comes from HLF and Arts Council England, each of which will contribute £7.5m for projects lasting up to three years. There will also be complementary support from other organisations where relevant, such as Historic England through its Heritage Action Zone initiative. Applications must come from partnerships, which are likely to include: arts and heritage organisations; community/voluntary groups; social enterprises; businesses; local authorities; parish councils; local economic partnerships; and other public sector organisations. Single organisations cannot apply. Potential applicants should first discuss their proposals with Arts Council England or the Heritage Lottery Fund. The next stage is to submit an expression of interest by 6 October 2016. Online applications will be open from 1 November 2016 to 2 January 2017. A £10m fund to train the next generation of heritage craftspeople, specialists and entrepreneurs was unveiled today by Sir Peter Luff, Chair of the Heritage Lottery Fund (HLF). Skills for the Future funding will have a particular focus on people who might not have previously considered a career in heritage because of a lack of paid training opportunities. It will address a shortage of skills in building conservation and the preservation of landscapes, species, industrial heritage and museum and archive collections, as well as public engagement and business skills. The launch of a third round of Skills for the Future is a key HLF contribution to the Government’s Culture White Paper. Skills for the Future challenges the sector to recruit from a wider pool of talent, encouraging more people to see heritage as a career open to them. Grants given out under the programme will help organisations draw in expertise and recruit in new ways. Past projects funded through Skills for the Future include: Brecon Beacons National Park Authority – Skills in Action; National Trust – Passport to Your Future; Tyne & Wear Archives & Museums – Heritage Engineering Skills; and The Waterways Trust, Ellesmere Port – Keeping History Afloat: Traditional Boat Building. Further details of Skills for the Future, which opens for applications today, can be found at www.hlf.org.uk. The deadline for applications is noon on Thursday 13 October 2016. Decisions will be made in February 2017. Ros Kerslake OBE has been appointed Chief Executive of the Heritage Lottery Fund (HLF) and the National Heritage Memorial Fund (NHMF). Chair of HLF Sir Peter Luff said: “Ros Kerslake has a rich background in heritage and an impressive commitment to the role it plays in making people’s lives better. She is the perfect choice to lead HLF and as a successful applicant for funding, she knows how the organisation feels to those who seek National Lottery support. Ros will join HLF at an exciting time, delivering new schemes to support skills, young people and resilience in the sector. She has the experience and enthusiasm to provide a clear vision and leadership for HLF’s highly dedicated staff, supporting our heritage and the role it plays in transforming communities across the UK. HLF Chairman Sir Peter Luff has announced a series of measures to boost skills, support organisations through change and give young people a key role in shaping the UK’s heritage. Speaking at the Museum’s Association annual conference in Birmingham, Sir Peter announced that the current Transition funding, Start Up grants and Catalyst small grants will be combined in a new programme, with an increased upper limit of more than £100,000 and more time for the money to be spent. This will help new projects get off the ground, build the capacity of existing organisations and help others make any structural changes necessary to meet future challenges. To support long-term financial resilience, there will be a new opportunity to apply for funding to build endowments, with enough flexibility to support small and large organisations. 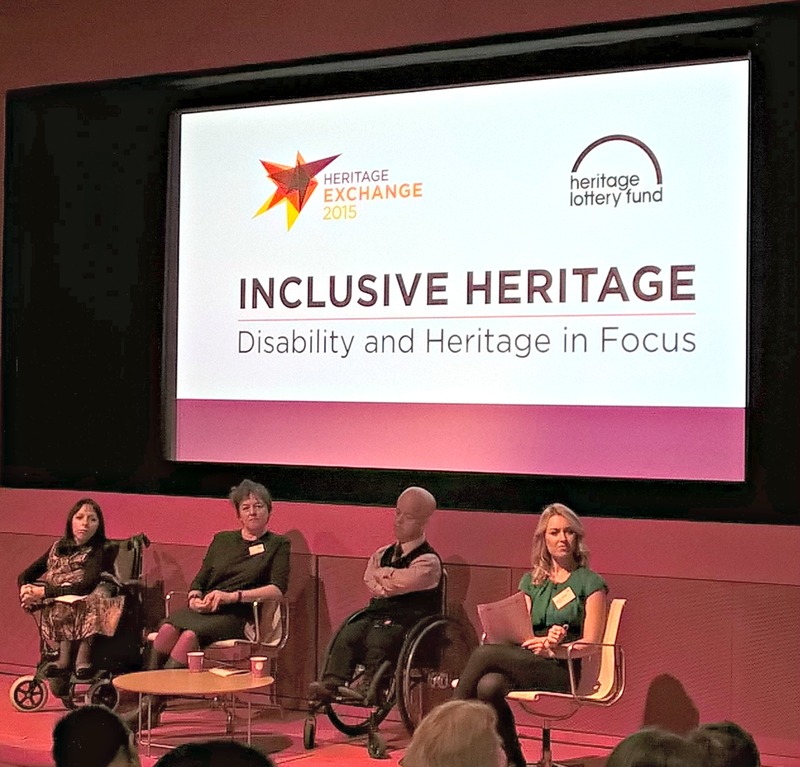 On Friday 30 October, the Heritage Lottery Fund brought together an audience of senior heritage and disability leaders at the Inclusive Heritage Conference to stimulate joined-up thinking and to encourage more applications from disability-led groups. To date, HLF has awarded £34m to 800 projects specifically aimed at benefiting people with disabilities and £17.9m has been awarded to 350 projects led by organisations representing the interests of people with disabilities. It’s now twenty years since the Disability Discrimination Act (DDA) was introduced and the Inclusive Heritage Conference was created as a platform to discuss the under-representation of disabled people in shaping, visiting and working within the heritage sector. The event also highlighted the achievements and challenges twenty years on from the Disability Discrimination Act and examined plans for the future. The next speech was by Esther Fox, Head of Accentuate Programme. Esther has worked in the cultural sector for the past fifteen years and is a keen advocate for the promotion of ambitious, disabled led cultural activities. “It’s twenty years on from the DDA, but we still need to think big,” she said. 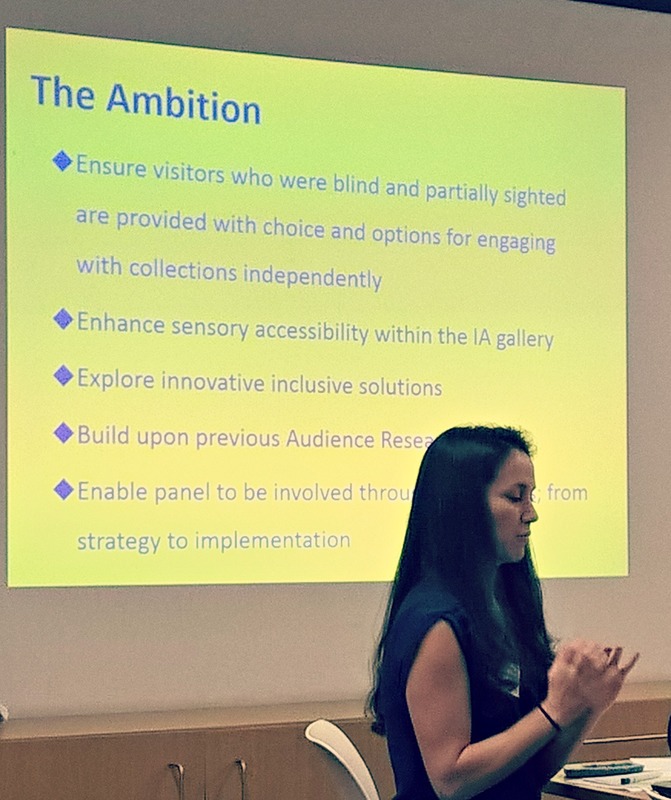 Esther also explained about the new Accentuate Programme and how it will build on the success of the Creative Landscapes project and develop some new areas of work around the distinctive heritage and stories of Deaf and disabled people. A series of workshops took place in the afternoon including ‘Inclusive communication: sharing best practice, learning styles and evaluation methods’. Speakers during this session included Katie Gonzalez-Bell, the Access and Inclusion Adviser at the Science Museum. Katie presented the new Audio-Eyes App, developed with and for blind and partially sighted visitors, which allows for a fully audio experience. The App has been well received by visitors and is an excellent example of how digital can transform the museum and gallery experience. Lynsey Robinson then presented on how the Sensory Trust are working to make the outdoor environment to become more inclusive by providing farm visits for people living with dementia and the creation of other sensory rich experiences. During conference, a new film was shown to delegates that included locations such as the RSPB Minsmere in Suffolk and the Foundling Museum in London’s Bloomsbury. Both places have shown that true access is achieved not just by making physical adjustments but also by making every visitor, whatever their requirements, feel welcomed and able to fully participate. Britain’s heritage is much-loved but its immense value and potential is being underused in some places, according to a new heritage index published on Wednesday 23rd September by the independent RSA think-tank. Produced in collaboration with the Heritage Lottery Fund, the new index reveals for the first time which areas could make better use of their heritage assets in order to drive local identity, improve residents’ well-being and increase levels of tourism. Set out by local authority districts in England, Scotland and Wales, the index ranks which areas enjoy the most physical heritage assets – but also measures local ‘heritage activity’ – such as museum attendance, rates of volunteering and investment in local heritage organisations. The index shows that there are some unexpected ‘star performers’ when it comes to levels of local participation and volunteering. Whilst the City of London and Kensington & Chelsea predictably top the asset charts – it’s Scarborough, South Lakeland (in the Lake District) and Norwich that take the top three spots in terms of ‘heritage activity’. The index also reveals which places have the most ‘heritage potential’ – with high levels of assets but lower levels of current activity. These include places such as Islington in London, Bury in Lancashire, Dudley in the Black Country, and Moray in Scotland and Newport in Wales. “The UK’s heritage is much-loved but its immense value is being ignored. If leaders don’t assess heritage assets, find it hard to describe what they are and don’t know who best to talk to about them, it’s hardly surprising that their heart-felt enthusiasm for the history and identity of their places is not manifest in a convincing local heritage strategy. New research by BritainThinks puts heritage at the heart of improving quality of life across the UK over past 20 years. To coincide with 20 years of investment into the UK’s heritage amounting to over £6billion, the Heritage Lottery Fund (HLF) commissioned BritainThinks to conduct in-depth research in 12 towns and cities representative of the UK population. The aim was to better understand the public’s view of that National Lottery investment and to see to what extent it had made places better to live and work in or visit. Applications are closing soon for museums in the Hampshire Solent region to join cohort 2 of the Heritage Lottery Funded Catalyst project ‘Inspiring a Culture of Philanthropy’. Museums will develop fundraising skills through training, mentoring, practical activities, peer support and shadowing opportunities. They will also learn how to build relationships with the philanthropic community and understand how to raise the profile of the museum and showcase the heritage product. The project aims to create a culture of philanthropy and inspire a real step change for both the museums and the philanthropic community in the area by supporting up to 30 museums over three years. We are also seeking mentors who will work with the museums involved in the project by providing on-going support throughout the training programme. Mentors will not be paid but will be given training and career development opportunities to develop skills and build new connections. Or email: romilly.beard@hampshireculturaltrust.org.uk or visit ‘Inspiring a Culture of Philanthropy’. Preliminary Notice of and Call for Papers for a Conference to be held at The Portico Library, Manchester, Friday 10 July 2015 10.30am to 4pm. Many independent libraries, museums, historic houses, galleries and collections have significant development needs and wish to access Heritage Lottery Funding and other funds to realise their ambitions. This conference, sponsored by The Portico Library and supported by the Association of Independent Libraries and the Historic Libraries Forum, follows a successful Historic Libraries Forum conference held in London last December. It will illustrate good practice in applying for and using external funds to support the work of independent libraries, houses and other cultural institutions. The keynote speaker will be Fiona Talbott, Head of Museums, Libraries and Archives at the Heritage Lottery Fund. She will be followed by case studies, drawn from the north of England, illustrating success in delivery of both large and small-scale projects. There will be ample opportunity to share ideas and for discussion. The conference will be of interest to independent libraries, museums, archives and galleries across the North, who are planning to bid for funds for development purposes or who simply want an update on development work across the sector. Fee £50. Delegate numbers will be limited to 50. Fiona Talbott, the keynote speaker, will introduce the theme of how to apply for funding successfully, by speaking on how a Heritage Lottery Fund application works. In addition, the Conference will provide an opportunity for up to six speakers to introduce projects they have been involved with in the North of England, illustrating challenges and achievements, lessons learnt and advice for newcomers to the bidding and delivery process. Two will be major presentations of 20 minutes. A further four will be shorter seven minute presentations, supported if desired by posters. The presentations will be followed by discussion. Expressions of interest should be sent to (admin@theportico.org.uk) marked FAO Tony Donajgrodzki, by Monday 16 March.